Clad in a fluorescent orange life vest, wind whipping through her hair, Janet Napolitano stood on a boat speeding across the slate gray waters of Humboldt Bay toward oyster beds as scientists briefed her. The University of California president traveled from her office in downtown Oakland to see UC's work in a rural community 300 miles to the north. Although UC Davis is the northernmost campus, California’s far north coast is served by California Sea Grant Extension and UC Cooperative Extension. The university opened its first Cooperative Extension office in Eureka in 1913 and established a Sea Grant presence in 1972, but April 27 marked the first official visit to Humboldt County by a UC president. The national Sea Grant program, established in 1966, was modeled after the nation’s successful land grant extension programs like UC ANR to bring university science to the public, but with a focus on coastal and marine issues. Today, the two Extension programs provide complementary services to address community needs in both agricultural and marine resources. On the boat, Coast Seafoods Company manager Greg Dale shucked an oyster fresh from the bay. The former Arizona governor ate the oyster on the half shell. “It doesn't get any fresher than this,” Dale said. Dale explained how his company works with California Sea Grant, UC Cooperative Extension, and other businesses and organizations to maintain the water quality in the bay. “We all need excellent water quality for economic activity,” he said. Dina Moore, who is married to a sixth-generation rancher in Kneeland and serves on the UC President's Advisory Commission for agriculture, told Napolitano she appreciates the expertise that Extension Specialists bring from campus as much as the research the advisors provide locally to manage natural resources. “I think the university helps us embrace the reality of being environmentally forward-thinking,” Moore said. Climate change is one of the challenges that UC is helping Humboldt County businesses address. With the support of university researchers, hatcheries are monitoring the chemistry of seawater with an instrument called a Burkolator. “When the pH, and more importantly carbonate saturation, of seawater decrease to the point that it is harmful to larvae – which can occur during upwelling – hatchery managers can shut off intake pumps or add chemicals to buffer the water,” Tyburczy explained. “We need someone like Joe to analyze the data and tell us what it means,” said Dale. 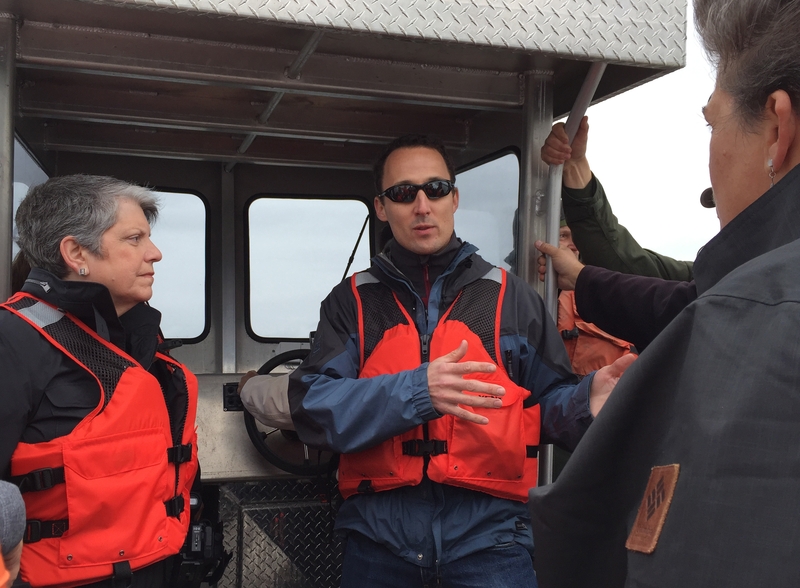 The boat tour of Humboldt Bay highlighted Sea Grant’s supportive research in aquaculture, water quality and ocean acidification. Napolitano’s tour also included trips to the Potawot Health Village in Arcata, the City of Arcata Community Forest, and visits with UC 4-H Youth Development Program members and volunteers – programs the Cooperative Extension supports. “I hope to show the president how local residents benefit from UC Cooperative Extension and to give President Napolitano and Vice President Humiston ideas on how the university may get more involved in solving local challenges,” said Yana Valachovic, UC Cooperative Extension director and forest advisor for Humboldt and Del Norte counties, who organized the tour. A version of this story originally appeared on the UC ANR Healthy Communities Blog.